Sometimes, being still looks like work. I'm sitting here in complete silence, a gentle breeze streaming through the windows. The Pacific Northwest spent months, and months, and months under a cloudy downpour, and we are finally getting some consistently warm weather. On a cool evening, this wind is the perfect reminder for me to sit in my rocking chair with a good book, and rest. Friend, I hope you find time in your busy schedules to carve away for rest. I know you may be in a season where that seems impossible (mama's, I'm looking at you). Our society glorifies a culture of busy, and in that busy-ness, I often drown. I need quiet time to reset, recharge, and renew my heart. Life outside these walls tend to be a bit chaotic, and God really lays "be still" on my heart...often. Almost too often. 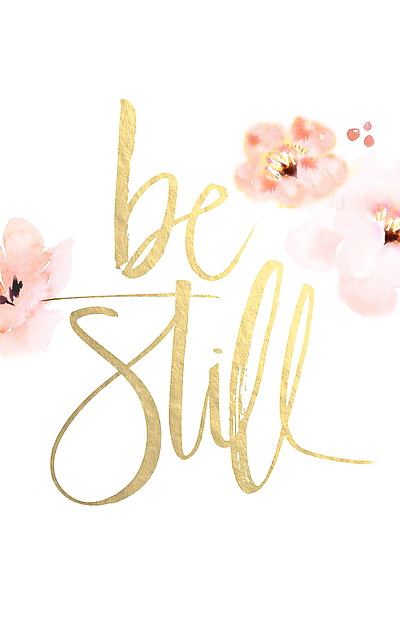 There was a time where any verse with the words "be still" would cause me to roll my eyes. I'm not kidding! It felt like this tired cliche, quoted when someone didn't have anything productive to say. In a time where my soul was anything but still, hearing those words made me angry. To be fair, the phrase most often came up after prayer over infertility, and the last thing an infertile woman wants to do is nothing. When the roller coaster of hope is beyond your control, still isn't comfortable. But God doesn't call us to be comfortable, does He? I've wrestled with these verses in my heart, and as I've struggled through trials both big and small, I've learned to appreciate this beautiful phrase. Be still and know (Psalm 46:10); The Lord Himself will fight for you, just be still (Exodus 14:14); Be still in the presence of the Lord, and wait patiently for Him to act (Psalm 37:7). Each verse tucked away in my heart, brought forth often as a reminder to rest. 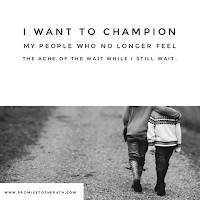 Know that God is a good God (and that He does a much better job at it than I ever could), that I must allow Him to fight my battles, and I can cheer from the sidelines in prayer. Wait patiently. Ouch. That one is my current work in progress. By the way, don't ever pray for patience. We have a hilarious God and He will give you plenty of opportunities! Stillness doesn't have to be a difficult concept. I think my previous eye-rolling self was so frustrated because I didn't understand that stillness sometimes looks like work. It does not mean to literally sit and do nothing. Rest does not mean to sleep (although that's important, too!). Sometimes, being still manifests itself through worship, repentance, obedience, prayer, surrender, laughter, tears... opportunities for a still setting can be all around us. When we focus on the sweetness of Jesus and His love for us, we enter that "still" state. We shift our hearts from our trials, our heartbreaks, our hurts, and we worship our Savior, knowing that in the midst of a giant Jesus hug, He has our back. Sweet friends, I know that even this is hard sometimes. When you want control, you hold onto the wrong focus. When you want answers to a prayer you've laid at Jesus' feet, you pick your pain back up again. You are not alone in this. I have these very same struggles, too. Let's not beat ourselves up that we get this wrong sometimes. It is my prayer that you're given a quiet moment to take a deep breath, refocus your heart, and soak in the goodness of this life. Lord, I thank You for calling us to be still and know that You are in control. In times of a busy schedule, a hard day, or an overwhelming season, I pray that You would help us carve out time to rest in Your hands. For the hearts that are hurting tonight, Lord I pray that they shift their focus to You, and see that stillness is so very sweet. Thank you for loving us, for caring about the small details in our lives, and for the work You are doing. You are a good God, and may we never forget that. Amen.